Leaving it all behind and starting fresh is a scary and daunting thought, but there are times when it’s totally necessary and worth it, and it changes you, for the better. I know it sounds cliche but I met Alessandro, aka hubby, when I least expected it. I wasn’t looking for a relationship, but we hit it off, I wanted to practice my Italian and was naive enough to believe that he was looking for someone to help him with his English. Needless to say our relationship blossomed and after 2 years together, the first 8 months in Canada and the rest a whole Ocean apart after he returned to Italy, we got married, with a small wedding in Niagara on the Lake with close friends and immediate family. Shortly after that I left my job and life in Canada and moved to Milan to be with hubby. One of us had to move and we agreed it would be me since I wasn’t happy in my job and needed a change. I figured I’d find another job. After all, I spoke the language from having lived here for a short time in the past and I had over 10 years of professional work experience. Surely I’d be a great asset, I thought, but I arrived at the height of the crisis and let’s just say things didn’t go as planned career wise. I started teaching English as a way to pass the time so I wouldn’t go stir crazy. Eventually though, I came to appreciate the slower pace, the freedom, the lack of stress and I was a new person, and moving at a different pace felt good. I no longer wanted to go back to a stressful career and stopped looking for jobs in my field. For the next year or two, I struggled to identify what I would do next, as I continued to teach English communication to business professionals. During this time I changed my diet from a relatively health conscious vegetarian one to a more natural, healthier, whole food plant plant based diet that is mostly vegan. I started the blog and developed a passion for cooking and learning about nutrition, and interacting with people from all parts of the world. One morning I woke up, with a clear idea, I was going to become a holistic nutritionist. After breakfast, as I mulled over it, I felt a bit ridiculous about the idea of going back to school in my late 30’s and convinced myself it was a bad idea. It took me a few months to shake the fears and self doubt and I finally registered for the course which I started in January. I have finally found my passion and my calling and I couldn’t be more excited about the future prospects. All of that was a long way to say, it’s never too late to follow your heart or your dreams. Don’t let fear hold you back, take it along for the ride by all means, but don’t ever let it hold you back. Welcome it, don’t resist it, embrace it, make peace with it, but set limits and don’t let it take over your life or stop you from living out your dreams. Enough about that, let’s get to the food shall we? I was inspired by the upcoming holiday season to develop this recipe. I wanted to bring you something bright, fresh and tasty and on the healthier side of things. 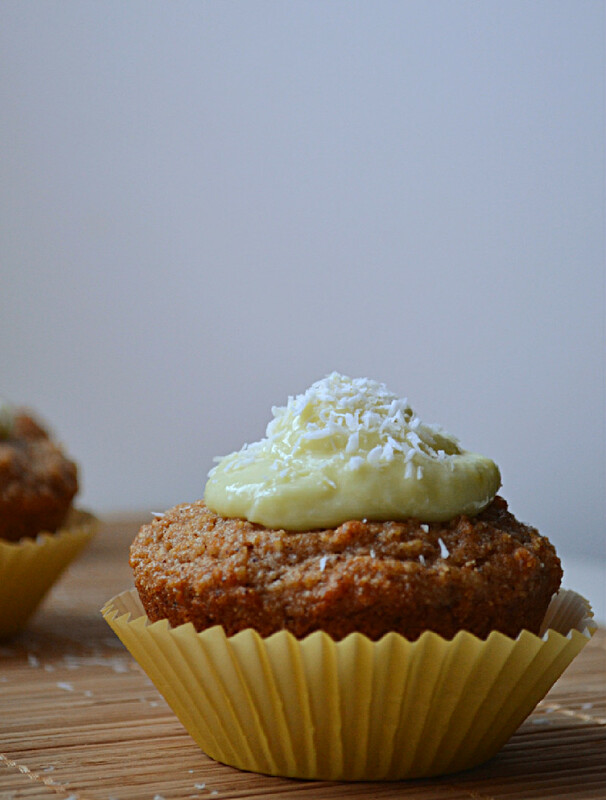 These cupcakes are vegan, oil free and sugar free and made with a combination of whole spelt flour, fresh ground almond meal and dessicated unsweetened coconut that has been ground into a coarse meal. 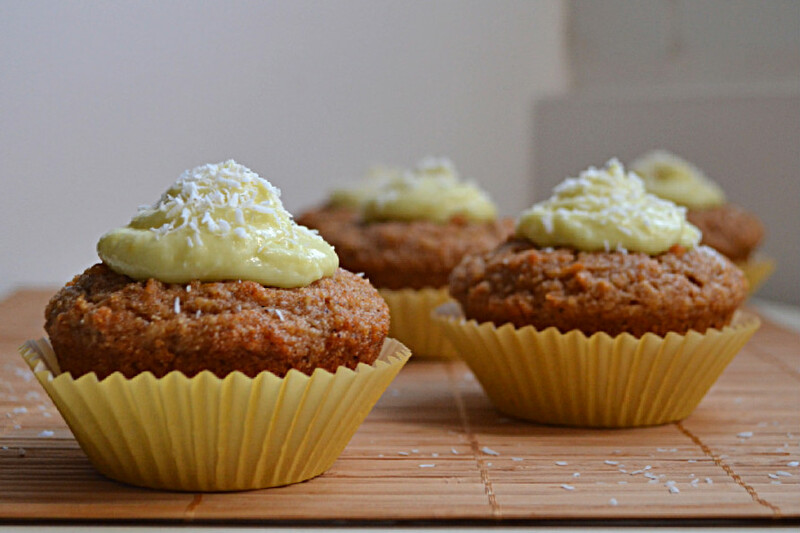 They’re spiked with fresh lemon juice and zest and filled and topped with a dairy free, egg free, sugar free Lemon Coconut Curd that gets its pastel yellow colour from a pinch of turmeric. They’re moist, with a bright lemon flavour, and a natural sweetness that’s not overwhelming. They’re a perfect addition to Easter or Passover brunch, your usual Sunday brunch, or as a treat anytime you feel like making a cupcake and eating it too. 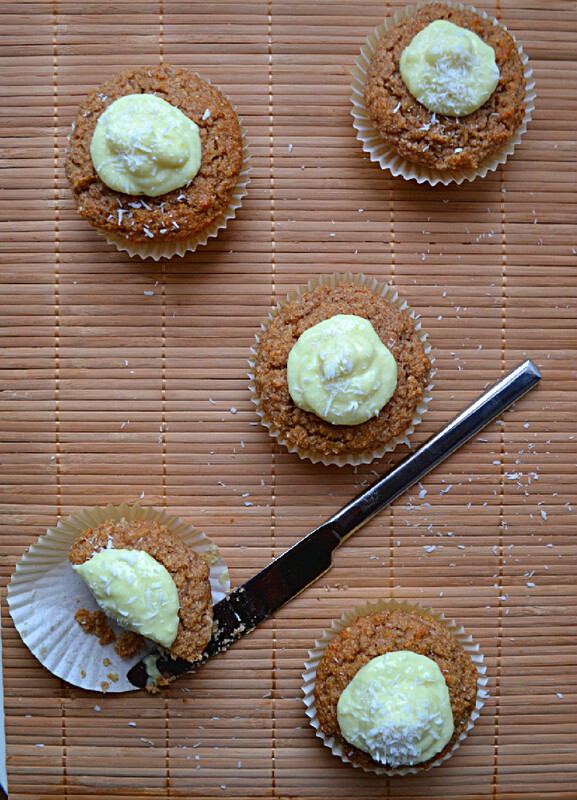 These cupcakes are bright, fresh, moist and full of natural lemon flavour. They’re filled and topped with a sugar free Lemon Coconut Curd that gets its pastel hue from a pinch of turmeric. They’re a perfect addition to Easter, Passover or any old Sunday brunch. Preheat oven to 180 C and line or grease muffin/cupcake tins. Sift spelt flour into a large bowl. Process almonds and shredded coconut and add it to the flour. 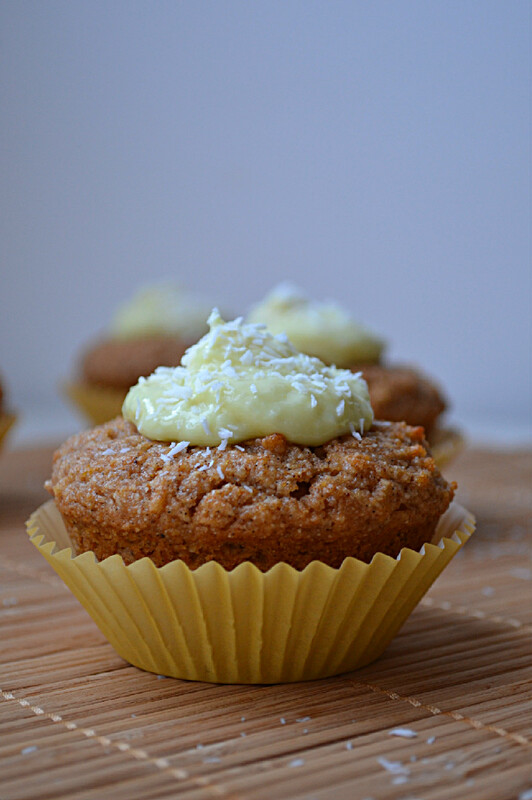 You can get away without processing the coconut, you’ll just end up with more visible coconut flakes in the cupcake. Add baking soda, baking powder, vanilla and salt. In a separate bowl, combine lemon juice, lemon zest, apple sauce, and brown rice syrup. Make a well in the center of the dry ingredients and pour in the wet ingredients. Fold gently with a spatula until well combined and you have a homogeneous mixture. If it feels too thick and dry, add a bit of water. This will depend on the humidity in your home and the moisture content of your flour. You want a batter that’s easy to scoop, not runny but not too thick either. Fold in apple cider vinegar and work quickly to pour the batter into the prepared tins. Bake on the center rack in a preheated oven for 20-25 minutes, checking on them after 20 minutes by inserting a toothpick into the center. If it comes out clean and dry, they are ready. Otherwise return to the oven for an additional 3-5 minutes, they should brown to a nice golden colour because of the almond meal. Watch them carefully so they don’t burn and remember that oven times and temperatures vary. Remove from the oven and let them cool to the touch, then remove them from the tins and let them cool completely. Once cooled, use an apple corer to remove the center, being careful not to puncture a whole in the bottom of the cupcakes. Fill the center, and top with Lemon Coconut Curd (recipe below) and a sprinkle of shredded coconut. Keep refrigerated in an air tight container and serve with 3 days. Add rice milk, brown rice syrup and coconut butter to a small pot over medium heat, whisking until the coconut butter is fully dissolved. Whisk in lemon juice, lemon zest, turmeric and coconut. Dissolve kudzu in a small amount of cold water and add it to the milk, whisking and letting it come to a gentle boil for about 2 minutes, it will start to thicken at this point. Remove from heat and set aside, it will continue to thicken as it cools. Meanwhile, dissolve the agar agar powder in a small amount of water over medium heat. Bring it to a boil and whisk until all of the agar is dissolved and you have a clear liquid, about 3 minutes. Pour agar liquid over warm rice milk cream and mix well to combine thoroughly. NOTE **If the rice milk cream has cooled too much, bring it back to heat before adding the agar, otherwise the agar agar will start setting on contact and create clumps. Process the mixture for 30 seconds to a minute using an immersion blender or a stand up blender. Pour into a glass container with a cover and place in the fridge to let cool for about 2 hours. Once cooled, give it a good stir. If it’s clumpy, blend it once again. At this point you can fill and top the cupcakes with the Lemon Coconut Curd immediately, or you can let it rest over night to firm up a bit which I highly recommend. These look really cute!! And must taste lovely too, I really enjoy lemon in desserts and combining it with coconut sounds like a win-win situation! Thanks you Elyann, they’re really tasty. They look wonderful Nissrine! I love using almond flour in my baking. I use it quite often and it’s one of my secrets for oil-free baking! I love the lemon in these! Thanks so much Brandi. You’re right, almond meal is magical in oil free bakibg, it adds so much moisture and wonderful texture. Abd yes, these certainly are lemony. These look brilliant! Love the lemon coconut curd! Thank you so much Naina. Hi just wondering what Kudzu is? I live in Australia and have never heard of it, can I substitute if for something else or omit it from the recipe? They look delicious!! Hi Rita, thanks for reading and for your comment. Kudzu is a Japanese ingredient derived from a plant. It comes in white chunks that have to be crushed and diluted in water then they are added to liquid to thicken it. It’s used to make gravies, sauces and creams. It also has healing properties and it aids in digestion. You can usually find it at Asian supermarkets or the Japanese section of an organic supermarket. If it’s too much trouble, you can substitute it with Arrowroot or less desirable corn starch. I hope this helps and I’d love your feedback on these cupcakes. I was actually going to ask the same thing about the Kudzu. So that’s one less question to ask. The next one is, what’s the difference between coconut butter and coconut oil. And whats the best substitute for coconut butter? Thanks Thea. Coconut oil is pure coconut fat while coconut butter is puréed raw coconut meat. There really is no substitute for coconut butter in this recipe as it gives the frosting flavour and structure. If you don’t want to buy it, you can make your own using unsweetened shredded coconut, by pureeing it in a food processor on high speed until it is smooth and buttery, but I’m not sure if it will ever get as smooth as the store bought stuff. I haven’t tried it though.